In May 1943, the WM received 25, 50-Ton flatcars of the 53’-6” AAR design from AC&F Lot 2603, and numbered into Series 2301-2325 as Class F-M. These were built to War Emergency standards with 6 4x4 wood stringers. Ajax power hand brakes were side mounted. 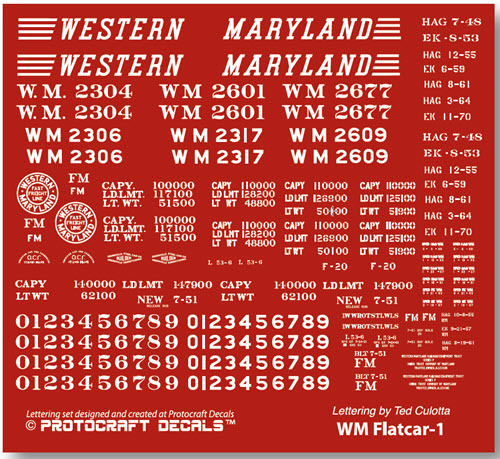 Paint & Lettering: Cars painted WM’s freight car brown (actually with a reddish tinge): TCP-99; lettering all white stencil paste. In 1953, the new Speed Lettering stripes were addopted with numbers changing to a sans-serif design.